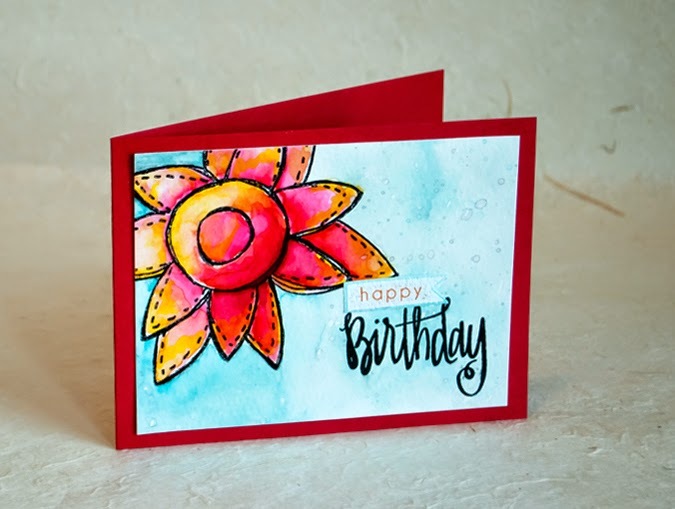 The burst of water colored cards in my feedly inspired me to take out my supplies, and this was the result. I'd forgotten how much fun, and how frustrating at times, water coloring can be (this is the second attempt). 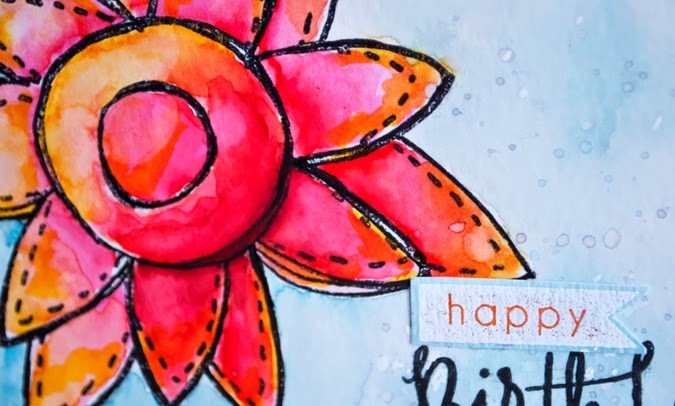 Using Tombow markers on watercolor paper is a great way to get bright colors -- the markers just melt when I add water. It can be mesmerizing! Apply the marker to dry watercolor paper and watch the magic! SU markers do not melt with water the way Tombow markers do. I love this huge flower, which was drawn by Claudine Hellmuth. Unfortunately, she is no longer designing stamps. I love her hand drawn, loose, designs and will miss them. I treated this one like it was almost the sun. And now the gloriously sunny weekend is over and time to return to work. Hope your week is a good one. Very bright. Very happy. Very beautiful. Love your happy card, it's wonderful! Ah, man, I was going to say 'gorgeous', but that's exactly what the comment above me says! Love the bold colours - the contrast of the red/pink/orange/yello against the pale blue-green background - stunning use of complementary colour! So beautiful! I really love Tombows for watercolouring with stamped images. You're right - they blend just beautifully. If you like them on watercolour paper, you should try them on shimmer paper! You will love the results. hmm..I do not have any shimmer paper but now I would like some! Love, LOVE this, Joan! The colors are fabulous and the big, loose flower is very relaxed, friendly and fun. That is so beautiful and happy-making. It made me think that you'd used it as a sun, definitely. My "problem" with that style of stamp is I don't buy them because I think in theory (as if!) I could draw something, but of course I never do. I really like the spattered background, too. You make me want to find time so see how Marvy LePlume pens react with water :D.
Oh! I love how this turned out!! This card just screams bright and happy. Love the look of watercoloring with those markers. I just got some Distress markers, and I wonder if they would work the same way? yes, I bet they would. I have one distress marker to try out. Green for leaves! Let me know. Thanks for the how tos. I agree with the consensus, its wonderfully bright and happy. This is gorgeous, Joan. I must check if I can do something with regular watercolours.